The Practical Guide to Internal Power has moved! The new site includes forums for questions & feedback about this course along with a forum to help you find training partners. How to Build Good Alignment. How to Capitalize on the Opponents Bad Alignments. Week 4: “Sinking the Qi” & Rooting for power. How to Begin Building Root Without a Partner. How Do I Judge the Depth of My Root? How Much Root Do I Need? The 3 most important qualities of Tai Chi Root. Week 5: Alignment Training Part 2 for even more Power. How do I know if my root is below the other person? Internal Power is basically about training to hit harder and harder with less and less effort. Internal Skill can mean a lot of things but for this course we’re mostly talking about the interesting things you can do with the power you develop. This course will take around 6 months to complete. Your movement will become more powerful. Your hits will be harder and penetrate deeper. There are even a lot of health benefits that come from this practice. If you’re new to the Internal Arts you may run into some funny words or descriptions. Don’t worry about it. There is nothing mystical or magical in what we do. We simply have a specialized lingo to help us better communicate about the skills and qualities we are working on building. For those of you with previous internal arts experience here are some of the skills we are going to work on over the next 6 months. Listening skill – the ability to perceive what is happening inside your self and inside your opponent. This skill is absolutely critical to reaching intermediate and advanced levels of the arts and we’ll teach you some very effective ways to build it. Rooting & ‘Sinking the Qi’ – These are body states / skills that are often talked about but very rarely trained in a functional way or to a moderate level of skill. With a little (lot) of hard work this will add a whole lot of power to everything you do and we’ll show you how to get there. Why the heck is this free? We love the internal arts and we’d like to see a dramatic increase in the quality of instruction that’s available to the general public. If enough people train the basics in this course that will happen. Even though the training methods taught in this program will provide a lot of benefit they still only scratch the surface of what we have to offer. 1) Align your body and fix your posture. To hit hard you need to get as much of your mass into the strike as possible. Because Mass times velocity = momentum. So greater mass means greater momentum which means a harder hit. To get more mass involved in your strike your body needs to be connected. If your shoulder is in a bad position then it doesn’t matter how much power you generate with your body. Because only a fraction of that power will make it to the end of your fist. If you’re lower back is out of alignment then only the power of your upper body is being used. Small improvements in your posture & alignment will have a very dramatic affect on how hard you can hit. Tension is also a problem. Too much tension in your shoulder will have the same effect as a misalignment, cutting off the power from your body. Too much tension in your lower back will do the same. Tension will also slow you down. So the more relaxed you are the faster you can move AND more of your body will be in the strike. Which gives us more velocity & more mass to increase the power of our hit. The better you get at relaxing as you strike the more powerful you will become. Being able to hit the opponent without leaving yourself open is very very important. This is also a gigantic topic that includes many different skills, methods and strategies. In fact it’s the major area of study in most martial arts but it’s well beyond the scope of this course. This course is focused on building Internal Power and Skill. 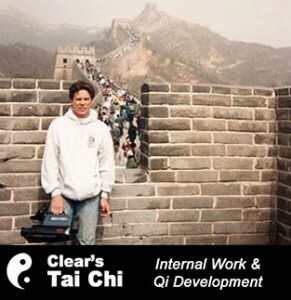 We highly recommend studying Clear’s Tai Chi Online along side this course. It will give you a deeper understanding of Internal Skill, Power and Tai Chi as a whole. This is like a car wreck. Some cars have big strong steel frames so that the energy of the collision is dispersed around the frame. Your body is the same way. The connective tissue (when it’s trained properly,) the skull and your skeleton disperse energy around and through the body. spreading it out so it doesn’t damage anything important. Your fat, muscles and other soft tissues act like crumple zones and airbags, absorbing the impact so you get surface bruises instead of ruptured organs. So to get a knockout you need the force of your hit to penetrate all that and affect the brain or other internal organs. …all that damage was caused by the energy of your hit that got used up doing surface damage instead of going inside their skull and affecting their brain. They may not like it. And they may suffer later. But right now all that effort and power you put into your strike has only made them more mad. How to get that strike to penetrate, so that it does very little damage on the surface but a lot of damage in side, is going to be a major focus of the training in this course. This kind of stuff can get very sophisticated and at higher level you will build skills that appear magical and will get you angry comments on youtube from skeptics and trolls. Always remember to keep things practical. Stay focused the real world application of the skills you are going to learn and NEVER underestimate an opponent or attacker. …IF you are willing to work hard. They call it Kung Fu (work skill) for reason. Skill will only come with lots of hard bitter training. How long should our Wu Chi standing sessions be? In the beginning you could spend a minute or two in Wu Chi if you like. 1 – Use the different alignment and relaxation exercises in this course to continually make your Wu Chi more and more correct. 2 – Practice getting into Wu Chi faster and faster. So, stand in Wu Chi and as soon as you get it as correct as you can, stop. Walk around for a couple seconds and do it again. Get faster and faster at going from nothing to fully correct Wu Chi. 3 – Incorporate the Wu Chi alignment and relaxation into everything you do throughout the day. Build this until the vast majority of your day is spent in Wu Chi. I like the idea of incorporating Wu Chi throughout the day; 15 minutes here and there and within a week you’ll build up a ton of hours! Brilliant instruction. I’ve been studying martial arts for 17 years and am finishing my second masters degree in oriental medicine (14 years later). There is way too much crap out there. I have stood in WuJi for an hour at the feet of a first class wushu judge and trainer of the Chinese special police among many other notable and accomplished martial artists. What is the benefit? Proprioceptive conditioning- your body learns what correct alignment and movement feels like. I emphatically agree that time spent repeatedly shifting into wu Ji is far more valuable (at least for the first few years) than standing alone, and is essential to a solid practice. This is the only resource I’ve ever seen to hand over the straight stuff. Thank you. This is awesome and as a newb to your site, I look forward to growing my skill set with you. Thank you, Glad you are enjoying the course so far. When do you start wu chi in this free program. The Tai Chi seminar was awesome! Will more material appear next week? Glad you enjoyed the seminar. New lessons will appear each week. Some of the structural principles of Wu Chi are taught in week 3. More is taught in Sigung Clear’s Book. I would like to thank you for the free lessons and I will buy the dvd’s when I get the money. I find this training fascinating and I am already noticing a difference in my well being and out look . Thank You Paul, I’m glad you are enjoying the training. free online course? Seems that the package claims to teach not only how to cultivate the heavy hand striking to break boards, but also tactics for practical usage. Is this a worthwhile purchase? The package from TRS is quite different than what’s in this course. The TRS package is focused on skills and techniques that can be learned and used in a very short period of time. While you will certainly notice some fairly quick benefits from a lot of what’s in this free course, the bulk of the rewards will come after you’ve put in some time and effort working with this stuff. Of course you should consult a medical professional to make sure any physical activity won’t conflict with the healing process. Use good judgment when working though these exercises. Use very light amounts of force and don’t do anything that would put pressure on or through the injured area. Now, if I’m doing the Internal Push Hands method the way it’s taught in Week 2, I have 4 points of contact to work with. 2 where my hands make contact with my partner and 2 where my partners hands make contact with me. If I remove my left hand and don’t use it we both now have 3 points of contact. In the beginning if you are playing to win this will seem like a disadvantage, but with a little practice the game is still equal because we have 3 points of contact we can use. To build skill though, the games should be played in a very cooperative way the vast majority of the time so you can pinpoint and fix errors. …as long as you are careful and you have a training partner who is willing to go slow and easy you should be able to train a lot of this stuff without difficulty. I have to say, usually I’m about as sensitive and responsive to energy as a bag of rocks. I actually seem to be improving and I think it’s the method of teaching: Finally lessons that are not riddles wrapped in enigmas, hidden inside mysteries!! THANK YOU, THANK YOU! THANK YOU!! Thank you, it’s great to see you are getting a lot out of the program. The ability to feel and perceive what is happening inside yourself and in an opponent is one of the most important skills in the internal arts. …and everybody is born with different levels of sensitivity. It’s no different than ear training in music school or any of the countless other professions that require developing specialized perception skills. In practicing the exercise, trying to align back against the wall, my buttocks prenents me frm getting back flat. Is there allowances for proper alignment when one cannot use this method? Lay on your back on the floor and prop your feet up on a chair so that your hips and knees are at 90 degree angles. This will roll your hips and lower back into the position you are looking for. You should find that there is no space (or very little) between your lower back and the floor. Use this exercise to relax & loosen the lower back and to get a feel for what correct alignment should feel like. This doesn’t have much if anything to do with the training [or at least not from what I’ve read so far] but as my e-mail is messed up I was wanting to know if you could tell me how to see if one has good balance or not. Stand with both feet on the floor. Close your eyes. Then raise one leg off the floor until your hip is at a 90 degree angle while keeping your eyes closed. Balance is a combination of skills. The most important one is your ability to perceive where your center of gravity is in relation to the rest of you. Most people their eyes to do this more than any other thing. As you work through this course you will get better and better at feeling what’s happening inside your body. One benefit of this is better balance. The stronger legs, relaxation, deep root and better posture you build from this training will also help. That lean is an over-extension that can be used to move them. Thanks. For me I’ve found that my eyes do most if not all of the balance control and when I close them I end up wobbling a little though now that I’ve started this training it has improved some. Hello, There isn’t a link to the seminar, am I missing it or is it missing from the page? Thanks. It should appear at the bottom of week one just above the “required equipment / tools you’ll need” Make sure you are logged in or you’ll only see the first part of week 1. I’m trying to sink my root, but while I’m in Wu Chi, my legs and thighs are shaking. Am I not relaxing that area enough? I don’t have a training partner, can I still develope deep root? This is common. Building root takes a lot of work. The deeper you root the more leg strength is required. As you get deeper and your legs get stronger you will be able to relax more and more. …and the more you relax the deeper you will be able to root and stronger your legs will get. A training partner or several will speed up the process however you can build root without one as long as you work at it. I’m still working through the weekly exercises, and yet having the challenged with leg strength. Some shaking and thighs vibrating, ( didn’t think something that looks so simple could be so physically challenging), can I still benefit continuing, or should I focus on proper Whu Chi until I can stand in this posture without legs shaking? Yeah, this training is a lot more physically demanding than it appears at first glance. Yes, you can benefit by continuing. However I would put most of your training time into the beginning of the course until you have that down well. When I was 5 years old, I broke my elbow. It healed perfectly, but developed a certain curve, that is actually common in this kind of injuries. I am 21 now, and I’ve been practicing karate since I was 3, and now I’m starting to learn about correct and precise postures. Do you think my results and performance will be affected, like, energy-flow-wise because of the physical circumstance of my limb? I don’t take any risks, i can do perform any kind of exercise, and apply full strength, I just have a weird arm when I fully stretch it. Thanks in advance, I really appreciate your will, and I would really like to eventually receive proper training from someone like you. The key is to use these drills and exercises to develop a feel for correct alignment. Correct alignment for you may be slightly different than for other folks. This is actually pretty common. Sometimes it’s due to an old injury. Often it happens when someone’s profession has forced their body to grow into an improper shape. If you try to force them into a 100% textbook correct posture it will actually be bad for them. Instead we use exercises like these and teach them what good posture and power generation feels like for them in their present state. Then gradually over time they train their body back to a more and more correct shape. If you look closely at Sigung Clear’s fingers you’ll see that sometimes they look slightly crooked or out of alignment. This is actually correct alignment for him due to a hereditary form of arthritis he’s had since he was young. Fortunately, because of the Tai Chi and Qigong, he has never experienced any pain or discomfort from the arthritis. Prior to finding your course I have been trying to teach myself combat tai chi from a (translated) Chinese text called “Chen Style Taijiquan” by Feng Zhiqiang, Feng Dabiao and Zhang Chundong. While I can practice the techniques, the still diagrams can’t really show how to move. A big “Eureka!” went up when I found this course (I also have Sigung Clear’s Combat Tai Chi DVD). My question is: The text refers frequently to “sticking the feet” and the picture looks a lot like the footwork in the introductory video at 22 min 40 sec. Could someone please tell me what the technique and purpose is for this? When is Whu Chi taught in the free coarse? You have me very interested in what you are teaching. Wu Chi is introduced in Week 3. During the week 1 video, Sifu Clear demonstrates the Tai Chi walk around the 22:40 minute mark. Once the heel of the front foot is put down, and the heel then planted, are the soles of both feet to be momentarily flat on the ground together as the weight is transferred to the new front foot, or can the heel of the new back leg raise up immediately? To me it feels better to let both soles temporarily hold the ground together as the centre moves forward onto the front leg. However, week 2 lesson is about not practising mistakes! Either way is good as long as the transition is smooth and fluid. In our beginning and intermediate programs there are several different ways to do this depending on what you are working on. Thank you for your advice on fluidity. I think that was my key problem. After stepping I was remaining static for a few seconds. Together with the week 3 Wu Chi lesson, the issue disappeared as one state flowed into the next as a continual movement. For those of you who are interested in testing their balance, I developed a “steadiness” test for my yoga postures some time ago. While the actual instruction is to sit still with a saucer of water on the head, this is very difficult to do if you are on your own, as most of the water ends up on you before you get it on your head! (Some say to use hydrochloric acid…) In place of this I have been using an empty, 1.25L PET bottle. While I can sit in the one position for an hour, I have yet to get beyond 10 minutes when using the bottle. I guarantee you will feel every tremor in your body, even the pulse on your scalp. I am only up to week 4 in this fabulous course, so I haven’t had much of a chance to try the same idea with Wu Chi or the heaviness exercise. I would be interested to see how others go with this practice. It may be easier to begin with a small amount of water in the bottle to begin with and gradually use less as you improve. I put in the wrong email account how do I change it? email me: ben@clearsilat.com and I can update your account with the correct email. I understand that these moves can injure a person pretty bad but can it hurt me if I do them wrong? Just like with any rigorous physical activity you should consult a physician before you begin and you should build into it slowly and carefully. If you use good judgment, follow the instructions, make sure to account for and make adjustments for any injuries or illness you may already have and start slow, you should have not trouble. The most common issue people run into with this training is they try to play hard and fast before they are ready and throw their back out or wake up the next day very very sore. Is the rooting exercise in week 6 all mental or are you actually lowering your center of gravity? You should drop no more than an inch or two physically and your center of gravity should drop significantly farther. This exercise should be both mentally and physically demanding. I only have two student/training partners at the moment, but I’m working on it!. One is a 13 year old boy who is already two inches taller and 3 kilos heavier than me. I was passing on the Sinking the Root techniques to him. I let him hit me before I began, and he gave me a timid slap. After preparing myself, he went again. This time he meant to knock me off my feet! His eyes went wide as he said “You didn’t move an inch!” Thanks guys. You have 2 converts here, now. I watched the week one video again, and think I must have fallen asleep or let my attention wonder the first time. The second time i blinked and had to rewind and watch parts again. Having read about but never really understood the meaning of “internal energy” I was blown away to see you able to strike without even touching the part and actually give me half an understanding of what actually happened and how you did it. As you work through this course you’ll find you can get more and more out of going back and reviewing the early lessons as well. In the Whole Body Breathing lesson is Sigung Clear thinking of his partners arms,hands etc. to get the feeling of the breath going into them or can he feel it in his hands? Some of both. And it’s going to vary some form person to person and change as you continue to develop your sensitivity. I notice the starter if this thread talks of a “strike without even touching the part”. Is this strictly true? I’m not sure where in the thread you are referring to. It sounds like this is a reference to our advanced Dim Mak training and learning to direct the force of a strike inside the opponents body. To be clear, this is NOT talking about no contact work. You are making contact with the opponent. However your point of contact is different than where the force of the strike is being expressed and where the damage is being done. So for example: you hit them on the shoulder and they feel most of the force from the hit on their hip. The basic version of this skill is something people use everyday. Anytime you drive a care, open a door or push a shopping cart around the store. You’ll get a feel for how to do this with a basic push pretty quickly if you put some time into the pushhands method taught in week two. Of course, doing this with a strike, in a stressful situation, is more difficult. But the difference is simply matter of training. I have 2 questions. Is the week one meant as demo and info only? I didn’t see actual training tips or did i miss it? Also Is each week automatically available when previous week ends or how does that work? Week 1 outlines some important principles and concepts we’ll be working with and the 50 minute seminar gives you several different things to play around with. Week 2 will give you a training method that we will use in various ways throughout this introduction. New lessons will appear below the old ones so eventually this will be one long page with all the lessons and you can use the table of contents at the top to quickly navigate between them. For those of us without a partner to train with or financial resources to buy heavy bags and other equipment, what type of breaking material would you recommend for week 2 training or any other suggestions would be helpful as well. There is some training you can do without a partner. Our Iron Palm & Iron Body DVDs are good for solo training. However, there is a lot that will take much longer to develop without a partner and there are many important skills you simply cannot develop without one. I highly recommend that anyone who has less than 4 semi-regular training partners, dedicate some time every week to finding more. The training method taught in week 2 requires a partner. You can sort of make do with a heavy bag or a wall or tree, but what you can work on is very limited and it’s easy to make mistakes and build bad habits if you don’t have a partner to help you catch them. For equipment I recommend saving up for a heavy bag (keep in mind you’ll need something very solid to hang it from.) Getting boards to break will quickly add up to more than the cost of a heavy bag and they can’t give you the feed back that the weight of a heavy bag can. Is Sigung Clear thinking of sections of the body like the shoulder or the lower back and in thinking he actually can feel the tension or lack of in these body parts and then he can affect them buy pushing while imagining the body part? You can look for errors in specific areas of the body like the shoulder or lower back, but in the beginning I recommend you simply feel first and go after whatever you find wherever you find it. In the beginning a lot of people wont have the sensitivity to know exactly what they’re feeling or where it is. So you’ll have to spend a bunch of time pushing with a partner. Make sure to play the game excruciatingly slow as much as possible. There are different exercises throughout this course that will focus on different things including structure, relaxation and root. As for targeting an error, once you feel it you simply push it. (don’t tense when you push.) If you can feel it then pushing it will be fairly easy. If you cannot feel it then no amount of imagination will help. The key is lots of practice. You can speed up the learning curve with live instruction or the drills on our Internal Power DVD but you’ll still need to practice quite a bit as well. there is a week 6 on this page but week 7 and 8 is not on this page. is the power striking dvd the same, is, ore different from iron palm dvd? Weeks 7, 8 and the rest will continue to appear on this page. You may need to hit refresh in your browser or clear your cache if a week should have appeared but has not. The Power Striking DVD and the Iron Palm DVD are quite different, though they would certainly compliment each other well if you trained them at simultaneously. How does one “feel”? What am I feeling for? What does this feeling feel like? I replayed lesson 2 several times and it looks like you were safecracking the other person’s body. WHEN WILL I SEE THE NEXT LESSON ? The table of contents at the top of this page will give you an outline of when new lessons will appear. You may need to hit ‘refresh’ in your browser the first time you visit this page after a new lesson is available. I have been teaching tai chi,and tai chi ruler system since 1972.i had my foot amputee.it has been a long hardoad.howwever, as a naturopathic doc, I can tell you chi saved my life. My question is how does my missing foot effect the chi flow,and is there any way to compensate in the self defense aspect. Bruce Lee had one leg shorter then the other.thanks. My humble opinion: Chi flows through all things in the universe, therefore i don’t think a missing foot would be much of an issue. Your leg simply ends a little sooner than the other leg. 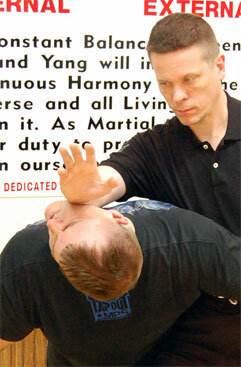 The most important aspect of self defense is mental. I am smaller than most grown men and always have been. That has never been a problem for me though because i believe i am every bit as capable of defending myself as a 7 footer. In fighting the feet are best used as root, so if you root with the bottom of your leg, wherever that is you should get the same result. As Bruce Lee said” Kicking someone in the head makes as much sense as bending over to punch them in the toe” (paraphrase?) The only weakness is the one you place on your self. My opinion doesn’t matter and Sigung Clear may disagree so take this for what it is worth. Sigung Clear began to discuss the 8 types of jin in Tai Chi. He mentioned Wave force and spiraling force; what are the other 6? Usually when someone refers to the 8 jin of Tai Chi the mean: Peng, Lu, Ji, An, pluck, split, shoulder & elbow. Tai Chi is usually considered to have 36 basic Jins though I don’t know if anyone has compiled a complete list anywhere. The 8 above and wave and spiraling would all be included in that. Tell me which lesson Sigung Clear began discussing this and I’ll be able to tell you more about what exactly he was referring to. I think there is a complete list in Dr.yang Jwing Ming’s book “advanced tai chi theory”. It has been many years since mine fell apart from repeated reading so I am unable to check. BE WARNED there is no practical training information or very little in this book certainly nothing to compare with the detail found in this course so far ( I am on week five.) Training techniques for “NORMAL” yang style push hands are given, tai chi ball, and silk realing in vol 2. so that would be £50.00 for two books that are in my opinion inferior to the free training we are receaving here. I have no doubt that my past training in yang and chen styles have alowed me to take in this course faster than a total beginer. (week 2 within ten min. of starting the closed door pushing hands (pushing bodies?) my one of my regular sparing partners who is both taller and heavier than myself was launched across the room too both our suprise.). If you mean to push people who you have made physical contact with then this program will build the body mechanics and internal skills to do this. Where is Sigung Clear’s school? Where are the live seminars usually held? I have been working on week one. I have watched the video several times and have been reviewing info on the internet. So far so good. I am truly amazed at the efficiency of the internal arts. The minimal energy required to create large amounts of power is the reason I have been interested in learning the internal arts vs. the external arts for some time. Will this course cover proper breathing during combat? It seems like it would be really important. I have 2 questions for the week 4 lesson. Sigung Clear teach us to practice rooting from wuji position which is static. On a fight situation how can we utilize the rooting (especially for the offensive side/usage) as we are facing a dynamic situation which makes us on a dynamic movement? First we train to build root as deep as our body height then we progressively increase the root depth. Once we are proficient do we still need to do a repeatable “melting sinking feeling” to reach the depth that we had achieved or just one attempt would be enough? Practice your rooting while doing your Tai Chi set and in push hands to begin learning how to move with it. As you build depth you will also build the speed at which you can drop. Have just watched the first video. It seems to be filling in the background to my training so far. I’m on the other side of the “pond” here in good old London so a trip to come and train with you is currently out of the question (shame). 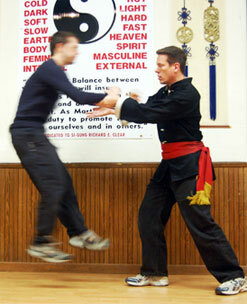 I am part of Chun Ming Dao martial arts academy and my Sifu teaches from a martial perspective. I have trained with people who are learning their Tai Chi primarily as a health choice. They are learning a somewhat “fluffy” style aimed at improving their well being. From what I have seen from their progress over the last two years this “fluffy” style doesn’t have as many health benefits as the correct martial forms and practices that I am being taught. Is this your experience too? It is refreshing to see someone teaching the “big picture” rather than focusing in on a “this way or no way” syllabus. I look forward to applying the full lessons that are “trailed” on youtube to my own practice. Should read 1000 hours of training. Darned dyslexia!! I currently do half a hour of Wu Chi and half an hour of Cloud Hands, Dragon and Tiger, and Marriage of Heaven and Earth daily. I’ve been at it for 8 months and the benefits are astounding. I’m intrigued by the “Waterfall rooting” lesson, because the first time I tried to sung my chi after a half-hour stand my forearms and thighs seemed to fill with molten lead, and when I sat down I felt as if there was a huge river of water pouring from the crown of my head to my feet. The sensation lasted a good 15 minutes. By the way, I’m 62 years old and weigh 350 pounds, but I feel better than I did at 40! If you feel your legs filling up while doing the “waterfall rooting.” let the bubbling well (the large hollow in the middle of each foot) relax more and open. Get that “waterfall” to continue and pour down into the ground. is the method to sung the chi in a later lesson? Or is it the carry the cauldron & grand Tai Chi? A bunch of the exercises throughout this course will increase the quality of your sung. Have just received week 6. I am noticing a definate improvement in my rooting since starting this course. Thankyou. My Sifu has said as much and commented that it is nice to see a student taking an interest in the internal stuff rather than just learning to get the form correct. The basic “hands on torso” push hands exercise is a perfect introduction to listening jin, and is a lot of fun besides. Snails pace competitive is good at reducing two people to fits of the giggles, as well as having a healthy level of frustration when you can’t figure out what you’re doing wrong. I am now understanding the teaching that my Sifu is giving at a much deeper level after seeing things from a different perspective. Very refreshing. Thank you, glad you’re getting a lot out of this program. I have not found anything about the wu chi position in the material I got on the internal power guide. I have only found one video (which had problems) called “1 Touch Ko;s of tai chi seminar”. Am I missing any material? Week 3 in the course will cover all the basics of Wu Chi and give a ways to train it and make corrections with a partner. I have to say, its nice finally having someone explain this all straight. Cleared up my understanding of Chi pretty fast. Thanks a heap! 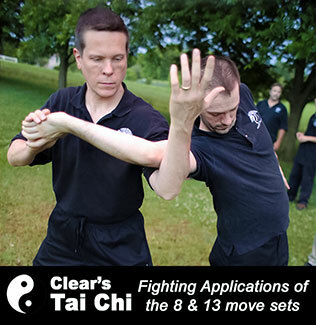 Every bit of the alignment from the Wu Chi should be happening while you do Wing Chun. Wing Chun doesn’t necessarily have to be as relaxed as the Wu Chi posture should be but I highly recommend working towards that. Thank you. I been doing, however I feel like I’m doing it wrong. Is there anyway I can tell if I’m doing it correctly. There’s always room for improvement. Most of the drills throughout this program will make your Wu Chi better. In particular pay close attention to the exercises in week 3 and week 5. Thank you for this awesome course packed full of great content about this internal art. As a former instructor and 2nd degree black belt in Tae Kwon Do I recognize the irreplaceable value of having a great instructor and training partners. Since I live too far away to train at your school, can you recommend a good combat Tai Chi school near me, to supplement what I’m learning from you? I live in an area in Los Angeles called the San Fernando Valley. More specifically I’m in Encino, 91316 zip code. I thought it would be easy to find such a school here, but it seems that most schools are emphasizing the health rather than the self-defense aspects of Tai Chi. We do have quite a few Kung Fu schools that include Tai Chi in their curriculum. Is it par for the course to have to learn Kung Fu in order to learn Tai Chi? Any leads would be appreciated. Thanks! Unfortunately, finding a teacher who can actually fight with Tai Chi is tough. We’re working to fix that but there’s still a long ways to go. Like many people practicing here, I lack a partner to practice with. I was planning on purchasing some videos to hasten my improvement and make more of my practice. But I was also wondering whether signing up for a local tai chi class would be a wise investment so that I could find like minded people who could practice push hands and an live instructor to correct my alignment and the such. 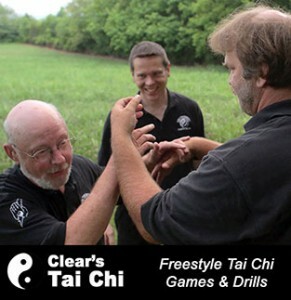 Which option do you think would produce more results and do you have any advice in choosing a tai chi school (assuming that I would like to keep as close to “Clears Silat” as possible)? I highly recommend making the search for training partners a regular part of your practice even once you have a few. Unfortunately Tai Chi schools can be pretty hit or miss. You’ll just have to visit them all to see what they’re about. The good news is there are lots of online tools like craigslist and meetup that you can use to find training partners as well. Thank you. I joined the FB group. This course is being very helpful. It approaches the subject from a content direction rather than from any one styles teaching. Fresh view = fresh insight. I’ve just watched the week 12 video. How is this “whole body breathing” related to the concept of song (or sung) that I find in Sun style Tai Chi? At first glance the “strength through relaxed, open joints and posture” seems similar to your teaching here. Sun style is not my main style so I would value your comments on this. Tension & breaks in structure will cut off your ability to do Whole Body Breathing. So you’ll have to get a decent Sung quality going on before you will be able to do whole body breathing. Thanks Ben. That makes sense. After playing with this for a couple of hours I’ve also found that the inverse is true. If you concentrate on whole body breathing then your “sung” becomes better. Kinda chicken and egg! I started Tai Chi for my health before circumstances moved me to a new teacher who is just as interested in the martial aspects. The lesson on blood pressure confirms what I have found. I also found that doing my 24 and 108 forms reeeaaly slowwlly and concentrating on the breathing is able to drop my blood pressure by about 10 points on both the top and bottom figures, as measured on my home bp machine. This effect lasts for around an hour. My GP was very impressed by this and has started recommending Tai Chi for his patients. Point it out to your local Doctors and see if it increases the numbers at your local Tai Chi practitioners! Yep, absolutely. The rooting and sinking will also help drop the blood pressure like that. Which videos or any other information sources would you recommend for more tips and methods on improving rooting and wu chi? 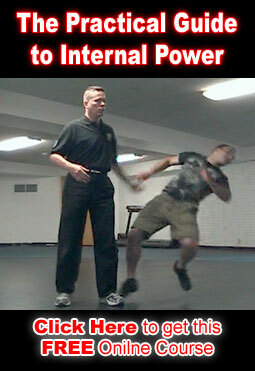 I am one of the students who took this online course for developing internal power primarily for health reasons. I’m not so focused on martial arts, though I loved learning Serrada Escrima many years ago. Thank you very much! I’m glad you where able to get a lot out of this program. Hi there, I think it’s an awesome course, but my questions are this: New lessons will be revealed here at the website every week after I subscribed, or is it always a specific day? The new content is unlocked here or is it sent via email? Do I have to write feedback in order for more lessons to be unlocked? I’m really looking forward for all the lessons. When new lessons appear is based on when you signed up. You’ll get email reminders when new lessons appear but all the content will appear here. You don’t have to write feed back or ask questions though it’s encouraged. Week 16 hs just answered a question that I didn’t realise I was asking! “How can all these seemingly different stances be correct?” I could see the difference in posture between Yang, Chen and Wu styles but couldn’t figure out how they could all be “correct” when they seem to be so different. The video has given me a simple answer to this puzzle. There are more ways to fix a particular issue than I realised. I love the way that the teaching in this program is all about the common ground, the simple principles that underly the various systems that are out there. In the instructions it said that I would get 4 emails in four days. Have not seen yet? Check your spam folder and make sure they didn’t get caught there. My chi returned after a long absence. Is this unusual? Not at all. The Internal Push Hands is an excellent way to build Chi. Thank you, glad you’re getting a lot out of this course. To pay us back just keep working the material in this course and tell other folks who might be interested about this course. I do not have a partner to work we realizing this is a hindrance is there other ways I can check myself? I do like the simple way of checking though. Also do you have seminars in DC this year coming up? Or any workshops out west? We leave for DC in a few hours. (sorry I didn’t get to this comment sooner.) workshop will be Feb 7 & 8 with a special session on the 6th. Working by yourself can’t give you the same feed back as a partner can. However, you can make do with heavy bags and trees and such. Just find a partner whenever you can, even if it’s not very often. Oh here is the box the very very below. I am ‘un’clear as to what to do next. I understand wuchi but where is the instruction? Can you be a little more specific with your question? I’m not sure which part of the course you are asking about. There isn’t a link where it says click here. ?? Which ‘click here’ are you referring to? What’s right above and below it? Applying the principles shown up to this point while playing with some Karate Kata has increased my appreciation of their potential. What do you think? Absolutely! Most forms from almost any style with a halfway decent used to contain some quality stuff. Unfortunately most practitioners, whether it’s Karate, TKD or Tai chi have no clue how to practice them correctly or what each form and each move is for. First of all, thank you very much for your uploads, this course is quite amazing. I have been in China for a year training Sun martial arts. One of my masters could stand like a tree and not be moved, while the other one was just like a ghost. I saw your videos and your explanations and decided to give it a try. Find it really useful. I’ve got a question though, I When you talk about “Other Martial Uses of the Root”, what do you mean on learning to take the energy up to your body? Does it mean it’s different to root from using the root to strike or stand like a tree? Simply sinking the energy down and having a deep root provides many martial benefits and this should be the primary focus of your root training. However, once you’ve built a significant volume and skill with root, you can do things other than simply sink it downwards. Hello. Sorry for my english, I am from Argentina. Thank you very much for this free course. I practiced Tai Chi “fluffy” style and I like your videos and explanations very much. I do not have any money to buy your dvds, but the youtube channel it is very useful to me. If someone practice “rooting” standing at second floor apartment or at eighth floor, is it the same that practicing at zero level floor (at ground level)? The question is because my Taichi academy is at eighth floor, and my house is at second floor. For training and in application it doesn’t matter. Just keep working on getting deeper and deeper and building your skill with root. As you build your skill with root and build your sensitivity you will begin noticing that different surfaces will feel slightly different. It happens in your mind, regardless of your ‘floor’; gravity is everywhere. 1) Sigung Clear seems transported from MT. Wudan from about 1000 years ago, incredible! 2) Thank you all so much for this free introduction, it is exactly what I need when I need it. 3) Can anyone explain how the increased chi and internal power (chi?) translates into a stronger healthier immune system? 4) I live in Italy and practice alone. I can not find anyone to do Tai Chi forms or Wing Chun with me. I restarted my martial practice mostly for the health benefits, but now I see I have to do things differently/smarter because I have heath problems and I want to improve overall. Is this the right place to start? Building chi helps your immune system in much the same way getting a good nights sleep does. The more energy you have the more resources your body can draw on to do what it needs to. Also, much of Chi Kung and a lot of the work in this program will help with circulation. Tension, blockages, stagnation etc… all limit your bodies ability to get rid of stuff that shouldn’t be there. The short answer is that our immune system arises from the marrow / spleen and is embedded within a common fascial ‘trench’ with blood and nerve vessels / capillaries surrounded by a ‘tensegrity’ of connective tissue made out of neurofascia that is 10 times more enervated than muscle with free ending proprioceptive nerve endings that just collects information from the taiji ‘ chi-gung postures ‘triggers’ and sends it back to the brain that then stimulates the parasympathetic nervous system (sympathetic is the accelerator – parasympathetic is the brake) that then triggers a hypothalamic relaxation response and you get flooded with neurotransmitters such as dopamine and serotonin etc. Plus, all lymphatic and venous return to the heart is accomplished by squeezing the lymph and venous blood back to the core for refreshing / revitalising / renewing / reoxygenation and waste removal by trillions of micro non-return valves within the capillaries by chi-gung wu chi and taiji function and form movements – especially fajin explosive moves. Also, and most importantly, the collagen (ellastin and fibrinogen) soluble crystals that make up the neurofascia are priezo-pyro-electric (when distorted by pressure or heat they create a polarity current) and so acts as a myoneuronal electronic system (that the acupuncture system works through) throughout the whole body touching each and every pocket within its internal structure (tensegrity) that stimulates the meridians from potentiality into activity; flushing your meridians, washing your marrow; rebalancing your ‘chi’ disequilibrium; returning you to good health. Also, to help, please find and activate all your ting points on each meridian every morning and each night before sleep (our little death) so you can repair at night. Stay with these things until you see and feel results – different for everyone – no set time – persevere. First off, thanks for the comprehensive answer to my question. I will save it for my reference. Question about Week2: I don’t have a training partner, so I have practiced the exercise against a wall and my home made Wooden Man – Muk Jung. I get a feeling inside myself of a slight imbalance in my posture, probably due to a chronic problem around my right trapezius/shoulder area. in any case I squeeze and compress myself trying not to lose my balance and when I get tired I stop. Does this sound correct? any pointers would be appreciated. You can certainly do some work with walls, trees, heavy bags & the like. Use the pressure from these type of objects to help you feel inside your body to find and fix errors. Of course, Get with a training partner whenever you can. They’ll be able to spot errors you missed and you’ll need them to learn how to feel inside an opponent. Gentleman. Hello again. Question about the Internal Push Hands. While I am doing Internal Push Hands agains a wall I feel “weightier”. I relax down and push, and then relax down and push some more. I feel heavier. Does this mean the force is returning and being redirected down my legs? That is what it feels like. Also my stance becomes more solid and feels stronger. Does this what we are looking for here? Am I going in the right direction with this? Thanks. It sounds like you’re headed in the right direction. At some point you’ll need to get with a partner so you can calibrate and see how what you’re feel now relates to what happens when you push with a partner. Training solo I have used the same method by pushing against a wall and then feeling the equal and opposite reaction that it generates back into my own body. It does not give a dynamic training as with a partner that moves and adjusts to counter-act, but at least I can start to feel if I am sinking my weight and basing the power correctly. Another method I use is with a swinging kick-punch bag. I notice that the basic hand positioning you used in the video for week 2 closely resembles that used in Judo. 1. Do you practice also with one hand on or under the partners elbow? 2. Can you suggest any other useful solo training methods? Yes, you can practice in any hand position. Start with both hands on the body to make it as easy to feel inside your partner as possible. Eventually you should train to do everything from any position and any point of contact. A heavy bag, the biggest heaviest one you can find, is the best thing we’ve found for solo training. Hello again. I want to ask about a ” strange” experience I had with week 4 material. First off thank you so much for clearing up this sinking the chi. Indeed people make it sound like the force from Starwars. I recognize now that Ihad done it before sporadically mostly by accident, which is not a way to practice and improve. After I rooted I did a few tai chi forms instead of walking around. It felt so good I jumped in feet first. 1) My practice just jumped up a couple of levels because of the stability and strength feelings. Truely incredible. 2) It is easier to feel the chi flow in each individual movement and nuance. What a rush! 3) Does it make sense to say i felt more solid and dense and at the same time more fluid and graceful? 4) Is it normal and ok if my legs were trembling after I stopped and resumed a normal posture? 5) What is the corelation or what is happening internally as we are doing these super stable external movements? Thanks a million. After a long time of mostly making mistakecon my own I am finally putting internal with external and learning the true spirit of Tai Chi Quan. 3. Yes, the better your alignment and internal connections are the more solid you will be and the more fluid and coordinated you will be. 5. Any number of things could be happening. It depends on what you are working on. In the beginning of this course, we’re mostly just working on making your posture / alignment as correct as possible and getting rid of excess tension. Is the first week only reading and watching the 50 minute course or is there any training excercises as well? How do I move to week 2? I don’t seem to get the content of the 2nd week. Yes, play with the stuff shown in the 50 minute seminar for the next week. Then the Week 2 stuff will appear on this page. I agree with others about the quality of this material. I am only on week 2 but I am already finding many benefits. Two questions. 1. I use Wu Chi as a relaxer before going to bed. I am finding that after about 5 mins I am getting lower and lower and I have to stand up and start again. Do you have an explanation and or remedy? 2. Others on the web advocate cycling through several different positions in Wu Chi. I find this useful to refocus at each change. Do you see any benefit from this? Thanks for the material and for your thoughts. Excellent! Glad you’re getting a lot out of it. Thank you for the feedback in relation to Wu Chi – there is a whole lot of work there! I have a question in relation to the actual push whilst in Wu Chi in the drill shown in week 3. I hope I am not jumping the gun and pre empting future weeks work. Whilst doing this drill, my friend says he just feels a weight from me and I feel that all I am doing to still relaxing and use very little more to push. On the other hand when I get moved it feels like a very strong arm push, which I would describe as a Grrr push. Both of us describe ourselves as relaxed at this point and feel the push from the feet. You say this ‘feel’ push is one of the hardest bits to get and I wondered if you have any more comments/ideas/drills to explain the feel of this to us. We both have a good understanding of the front stance/rear stance type push hand drills and practice. When you do the simple feel push in this weeks video you appear just to lean forward a tiny little bit. We are struggling to get the sideways push you are doing but up/down/straight ahead we seem to be able to do without adding tension to the arms. The sideways one seems to end in tension in the arms/shoulders. 1) Make sure you’re going slow enough. Everybody always pushes faster than they can perceive what’s happening inside the body. Building your ability to feel is hard but the slower you go the more you can sense and the faster this skill will grow. 2) You want firm but soft contact with the other person. Keep your arms & hands relaxed and this will improve your ability to feel quite a bit. 3) Don’t worry about how much tension our force your partner uses. Only how fast or slow they go. The more tense they are the easier it will be for you to deal with them. However, if they’re going to fast you wont be able to make adjustments and learn what needs to happen. Typically most of the Grrr forcefulness you feel is your own. 4) If you find you have to tense your arms to push then you are pushing into an area or on a line where the opponent is stronger than you. Either because that line is strong for them or it’s weak for you. You’ll need to play with it to figure out if the error is in yourself or in where you are trying to push. Hello again. I am writing because I am in a rut with week 7 and 8. Week 8 lessons help, but I have gone backwards in my practice. My root has weakened! Is weight training deleterious to Tai Chi somehow? At times my root feels pretty deep, but if I am distracted or start into a form of Tai Chi it breaks. I know because I feel light and get unbalanced. This has happened to me in the past and I could not get over this problem. I can now recognize thst in the past this was a major hindrance to my progress. I try to keep the waterfall going, but maybe i am concentrated too much on doing the forms very well. What should I be looking for or what should I do? Go back to earlier lessons? Thanks again. Weight training is only detrimental to your Tai Chi if you use poor body mechanics while you do it. Make sure to study weight training from a skilled teacher and use as much of your Tai Chi principles as possible. Your root will fluctuate wildly in the beginning. The more your practice the deeper you’ll get and the more control you’ll gain. Practice with a partner as much as possible. This will give you reference that will help speed up your development. When you work on root in the form, focus on just root in the beginning. Don’t worry about weather anything else is correct. Just focus on root. Do this with every Tai Chi principle one at a time. Also, it’s always a good idea to go back and review previous lessons. As your skill improves you will be able to learn more and get new things from previous lessons. At the same time keep working on new stuff. You never know when something new will shed light on something you’ve been struggling with. Thanks for your response Ben. Will do. For those of you out there let me say a few things about what i did to help myself. I reviewed everything. I only practice when I can dedicate some time without distractions. Even if it is not much time – total relaxation and concentration. Next I rooted like a bear with water fall rooting for as long as it took. The first time took longer, until I could feel waves of relaxation traveling up my legs to my head. After that the rest was a snap. Doing the forms is going well again. Just have to mention I also concentrated on the yongquan and laogong cavities which helped. Could you comment on how the huiyin yongquan and laogong factor into the root and fa jin. Thanks. The main thing for rooting at this stage is that they need to relax. The more relaxation the deeper you can root. Most people don’t realize how much tension they’re holding at the yongquan. Gentlemen several things. First is there a good way, visualization maybe, to expand the thickness of my root? I just realized today It is a problem since I have concentrated on depth so much. Second because of problemsregarding my lungs. I have a scared right lung and have problems filling them with air, at times this can greatly affect my training and life. Is there an exercise that I can do. The treadmill helped a little with this, but is there a specific exercise in our art? Please help as thisis blocking me on the whole body treating this week. Thanks. The first goal with width should be the circumference of your body. So if you were to stand with your feet shoulder width apart and draw a circle around them, make sure your filling that circle all the way down. Use visualization at first but ideally feel your root expand and fill that space. For breath, work it slow and soft. Relax and don’t force it. For the body breathing focus on relaxation and filling the body without expanding the lungs to the point where it becomes an issue. Hi, training in the 8 move set is available on video.